Superfoods are nutrient rich foods that can help you achieve better health. There is no set criteria for what qualifies as a superfood, but they are rich in antioxidants, polyphenols, vitamins, and minerals. Regularly consuming superfoods has been shown to prevent chronic disease, slow the aging process, and give you lots of energy. While backpacking, I like to consume as many of these superfoods as I can so that I feel at my best while pushing myself physically. Check out this list of my favorite superfood backpacking food ideas. Chia seeds are an ancient Mayan superfood consumed by warriors for sustained energy. These tiny seeds do not need to be refrigerated or cooked and can be mixed with any liquid or food really. They don’t have much of a taste but do turn slightly jelly-like when they are exposed to liquid. Add them to your backpacking meals or just put them in water and chug away. Hemp seeds are like chia seeds in that you do not need to refrigerate or cook them, which makes them a great backpacking companion. They are high in omega 3 and 6 fatty acids, protein, Vitamin E, and minerals. Shelled hemp seeds, or hemp seeds that have had the shell removed, have a very mild nutty flavor and a soft texture. Nutritional yeast has been shown to have anti bacterial and anti viral properties and help with immune function. It offers a full spectrum of B Vitamins, amino acids, vitamins, and minerals. Nutritional yeast comes in a powder like form and is used by many vegans for a cheese substitute because it has a mild cheesy flavor and a yellowish color. Sprinkle it on your dinner for a delicious healthy boost. Most brands have been fortified with synthetic added vitamins so you want to look for a non-fortified brand which has naturally occurring vitamins and nutrients. Packed with healthy fat and much needed calories, oil is an easy addition to any backpacking dinner. Rebottle your oil of choice into a small plastic bottle and seal it in a ziplock bag. Oils are a very calorie dense food, meaning you get a lot of calories per ounce. Calorie dense foods are smart choices for backpacking so that you won’t have to carry as much food weight. Seaweeds most well known benefit is that it is high in iodine, which is lacking from most other foods. Getting a sufficient amount of iodine is vital for your thyroid gland to function properly. Seaweed is also high in micronutrients like folate, magnesium, calcium, zinc, and selenium. I like to take dried seaweed with me on backpacking trips because it weighs almost nothing. Cacao nibs are basically chocolate in its most raw form. Packed with antioxidants, healthy fat, and magnesium. Magnesium is key to nerve and muscle function as well as 300 other biochemical reactions in our bodies. Cacao has a bitter taste that is acquired and if you don’t like the nibs plain, you can get dark chocolate with nibs in it. Aloe vera has 18 amino acids that work with other compounds in our bodies to deliver many health benefits. These benefits include improved digestion, alleviating joint and muscle pain, improving immune function, and lowering cholesterol and blood sugar levels. Health Ranger has a freeze dried aloe vera powder that is really convenient to carry backpacking. Quinoa is a very protein rich plant food containing all nine of the essential amino acids. Its also high in fiber, antioxidants, and minerals. For backpacking purposes, make sure you find a fully cooked instant quinoa so you don’t have to let it simmer for a prolonged time. Use it to replace rice or pasta in your dinners. Berries are one of the most well known superfoods and are high in antioxidants and fiber. You can eat them plain as a snack while backpacking or add to oatmeal, bars, tortillas, nut butters, trail mixes, or quinoa. You can buy them dehydrated or freeze dried, but freeze dried retains more nutrients. See my article on dehydrated vs. freeze dried foods for more info. My favorite berries for the trail are blueberries, goji, and acai. Freeze dried berries are more expensive than dehydrated, but they also retain more nutrients. Walnuts one of the oldest known tree foods and are high in alpha-linolenic acid (ALA), antioxidants, manganese, and copper. They are good for your heart, can lower bad cholesterol, and are anti inflammatory. Nuts are another calorie dense food so I’m sure to always bring them on my backpacking trips. Pumpkin is one of the best known sources for beta-carotene, which is a powerful antioxidant that gives orange vegetables and fruits their orange color. Pumpkin also contains a lot of fiber and potassium, both of which are very important for backpackers. The easiest way to incorporate pumpkin into your backpacking diet would be to buy a freeze dried, powdered form of it. Its often hard to consume a sufficient amount of green veggies while backpacking. The priority for longer trips is often consuming enough calories so low calorie vegetables will often take a back seat. You don’t have to miss out on all the nutrients vegetables offer if you take some sort of green juice powder. These powders don’t always taste great so I like to just add mine to water and drink it fast at breakfast to get it out of the way and start my day off hydrated. 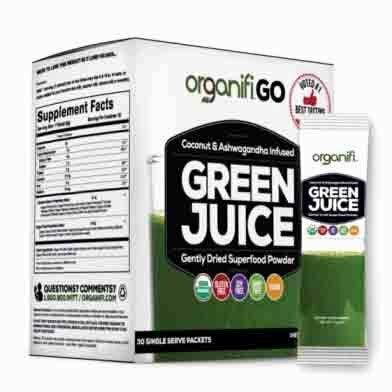 My favorite is Organifi Green Juice. Its organic and packed with superfoods like chlorella, spirulina, beets, wheatgrass, ashwagandha, turmeric, and more. Cordyceps is a medicinal fungus, or mushroom that has been used for centuries in traditional Chinese medicine. One of its most interesting health benefits is that it has been shown to increase oxygen uptake and aerobic capacity. These mushrooms are used to treat respiratory and pulmonary disease. A Japanese study showed that cordyceps extracts dilated the aorta by 40% which increased blood flow to the muscles and therefore greatly improved endurance. Yerba mate is a tea like drink made from the leaves of the South American holly tree. It is known as the “drink of the gods” by native South Americans. Yerba mate is naturally caffeinated, although less than coffee or black tea, and contains a healthy dose of nutrients. These include antioxidants, polyphenols, amino acids, vitamins, and minerals. The low caffeine content is good for backpacking because it helps perk you up when you need a lift but doesn’t give you the crash that coffee can. Ghee is another healthy fat that is easy to take backpacking. It is clarified butter, or butter with the milk fats and water removed. It has been used for thousands of years and has benefits both inside and outside the body. You can use it on your skin to treat burns or rashes or as a moisturizer. Ghee has both short chain and medium chain fatty acids and is high in vitamins A, D, E, and K2. This delicious superfood is also know to improve digestions and reduce inflammation. Cinnamon is so easy to add to backpacking breakfasts, coffee, tea, or nut butters. It is ranked as the number one spice for antioxidant power. Its also a powerful anti inflammatory, anti microbial, and has positive effects on blood sugar, immunity, and digestion. Which Nuts Are the Healthiest to Eat? Have you tried incorporating any of these backpacking food ideas into your trail diet? If so, have any in particular made a difference in your performance? I often go backpacking with family and friends, and we always struggle with the food because foods need to be kept in a cooler, which is quite bulky. So, we usually take a sandwich with an apple and fruit bar to give us energy. And we always end up spending a fortune to eat in a restaurant after the trip. I’ve never thought of bringing the food that you’ve listed in the article. Excellent suggestions and I thank you for this! I just would like to know more about the Aleo Vera. Is this plant edible? If so, how can I eat? These are more of additions to what you would bring on a backpacking trip. If you need ideas on meals see my articles Best Freeze Dried Meals for Backpacking or Lightweight Backpacking Food Ideas. If you’re more of just a day hiker I’ve also written Best Day Hike Foods. Aloe Vera is an edible plant, but I would not take the fresh version backpacking because it is too heavy. Taking the powdered form allows you to get all the nutrients without all the weight. This is really great information! I´m very interested in healthy food and I think it´s really a good idea to take super foods along on backpacking tours. I haven´t done backpacking tours but I love to go for a days hiking in the woods or the mountains. The trail mix recipes are perfect for those trips. I didn´t know about freezed dried fruit and cordyceps. Both sounds to be very healthy alternatives. Thanks for the recipes listed at the end of your post. The chia recips I definitively want to try out! The superfoods are great to incorporate into daily living as well 🙂 Glad you found some of the recipes helpful. Would love to hear if you try any and how you like them.